It all started in November 2008 when I bought Chantely Futres Luv of LiberLumar, nicknamed ‘Raka’. 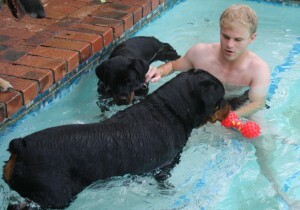 I owned two Rottweilers when I still stayed with my parents in Johannesburg and always wanted to own one again. Raka quickly crawled into everyone’s heart and became one of the ‘kids’ in the house. At the time we did not consider showing or breeding. We obtained Raka as a pet and, in hindsight, sadly decided to have him neutered. I became more and more involved in the Rottweiler fraternity and decided to source a top quality female for showing. Eventually, in February 2010, Spartan Buffy of LiberLumar, nicknamed ‘Gaia’, arrived at our home. I started showing her aged 4 months and from there the show-bug took charge. Since she started her show career she had multiple wins. She was awarded Breed Champion status in 2013. She is one of few females with a BA and BST qualification. She retired from showing and breeding in 2016. In August 2012 we bought an Arzadon Tayson daughter, bred by AI, Spartan Casimaria of LiberLumar, nicknamed ‘Bella’. She is a half sister of Spartan Buffy of LiberLumar. She has BA BST and BH qualifications and loves obedience and man work. We have imported from California Qwin Vom Haus Burns of Liberlumar – daughter of Elvis Von Der Mulbachstrasse and Sierra Vom Haus Burns. She is a joy and enjoys her new home in South Africa. I became more and more involved with the Rottweiler breed, wanting to learn as much as possible. I am a qualified Aptitude Judge and busy working towards becoming a Specialist Rottweiler Judge. Currently I am serving as a committee member on the Western Province APT sub-committee. A-litter: 6 females and 3 males, was born on 20 May 2012 from Spartan Buffy of LiberLumar. The sire to this litter was Chicco Earl Antonius [(IMP SPAIN), IPO1, ZTP]. From this litter we kept LiberLumar Andromedah, nicknamed Avo, a feisty and strong female. She has already proved herself at shows from the age of 4 months. B-litter: 4 females and 9 males, was born on 5 June 2013 from Spartan Buffy of LiberLumar. The sire to this litter was Orka vom Vilstaler Land [BH (GER), IPO III, V, (IMP AUT), ZTP]. C-litter: 4 Females and 6 males, was born on 3 June 2014 from CH Spartan Buffy of Liberlumar. The sire to this litter was Valdez Dell’Antico Guerriero of Kimshoaz (Import Italy). 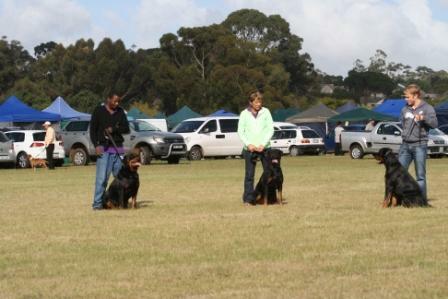 From this litter we kept two puppies: Liberlumar Cain a beautiful male and he has proved himself in the show ring since the age of 4 months he won Best Puppy (8 months old) at the Cape Rottweiler Club Championship show under judge Sue Carter. In February 2017 he was awarded Breed Champion Status. He passed his BA and BH and currently we are working towards an IPO qualification. His sister Liberlumar Cassia is also doing well in the show ring. She had her first litter in March 2017 4 females and 3 males. D-Litter: 6 females and 5 males, was born on 6 August 2014 from Liberlumar Anatola and Ginn Rotti Kingdom of Einzigartig. Liberlumar Dallas owned by Darren Hedenskog is seen in the showring. E-litter: 2 females, was born on 6 September 2014 from Spartan Casimaria of Liberlumar. The sire to this litter was Ginn Rotti Kingdom of Einzigartig. We kept Liberlumar Ebony a very feisty and busy little girl she keeps us busy!! F-Litter: 4 Males and 5 Females, was born on 8 April 2015 from Spartan Casimaria of Liberlumar and CH Glenxaba Fire Flame. H-Litter: 4 Males and 7 Females, was born on 10 July 2015 from Liberlumar Anatola and CH Legion Urban. I-Litter: 2 Females, was born 10 November 2015 from CH Spartan Buffy of Liberlumar and CH Legion Urban. J-Litter: 6 Females and 3 Males 23 July 2016 from Qwin Vom Haus Burns of Liberlumar and CH Liberlumar Cain. K-Litter: 3 Females and 2 Males 31 July 2016 from CH Spartan Buffy of Liberlumar and Champ from Royal Breed. L- Litter: 2 Females and 4 Males 28 September 2016 from Spartan Casimaria of Liberlumar and Liberlumar Cain. M-Litter: 4 Females and 3 Males 21 March 2017 from Liberlumar Casia and CH Glenxaba Fire-Flame. N-Litter: 5 Females and 5 Males 9 May 2017 from Spartan Casimaria of Liberlumar and CH Glenxaba Fire-Flame. M-Litter: expected date of birth 4 July 2017 from Qwin Vom Haus Burns of Liberlumar and CH Liberlumar Cain. O-Litter: 6 Females and 4 Males 1 July 2017 from Qwin Vom Haus Burns of Liberlumar and CH Liberlumar Cain. Liberlumar Oxana will be staying with us. P-Litter: 4 Females and 3 Males 6 January 2018 Qwin Vom Haus Burns of Liberlumar and CH Liberlumar Cain. Q-Litter: 1 Female and 2 Males 4 May 2018 Liberlumar Casia and CH Glenxaba Fire-Flame. My goal is to breed Rottweilers that are excellent in conformation, character and temperament. My aim will always be to ensure litter quality – to improve on both dam and sire lines. To breed Rottweilers that is family dogs with sound temperaments. Show dogs and workings dogs as the Rottweiler is a working dog. Our puppies are raised with lots of love and care in the best environment a puppy could ask for. They are de-wormed, vet checked to ensure maximum health and general well being. All puppies are Micro-chipped and registered with KUSA, temperament tested at 49 days to ensure their temperament and to be absolutely sure the correct puppy is placed with the correct owner. Liberlumar Rottweilers are an extension of our family – they are part of our everyday lives. At LiberLumar our Rottweilers thrive on love and attention. Please take a look at “our family” of Rotties – each one loved and adored in his or her special way. Feel free to forward any questions or comments to my contact page.